I am going to cheat a little bit today, because I haven’t been out in the garden today, partly as we were busy with other things and partly as it has just started to rain. It has mostly been a lovely sunny week, so can’t complain. Anyway, here we go with my Six on a Saturday. There are so many gorgeous roses out right now, with no doubt more to come in the next few weeks. I’ll probably be doing some posts about the Lady Norwood Rose Garden, so if you are interested in roses, do keep a look out. 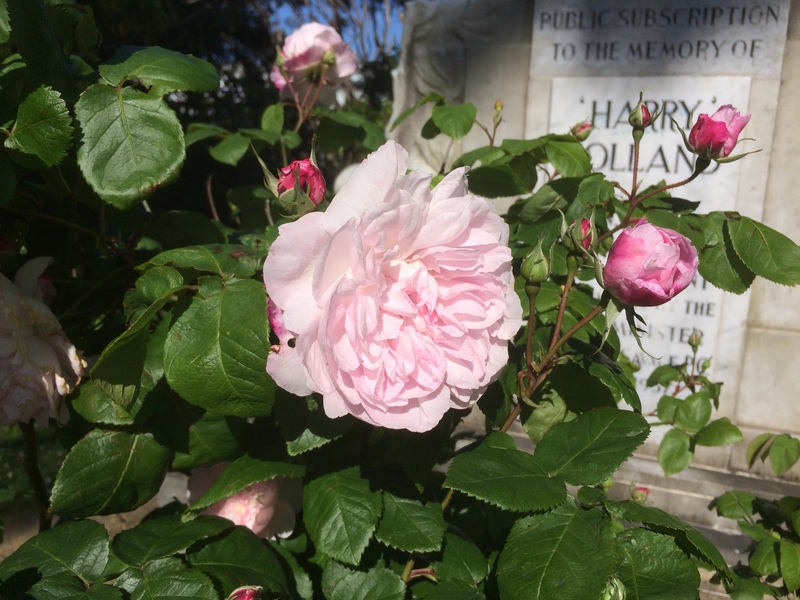 In the meantime, here are two I spotted in Bolton Street Cemetery, where you can find a nationally important heritage rose collection inspired by original graveside plantings. The rambler rose below is one of them I believe. The pink one at the top of the post and also below was planted before 1900. You may have seen that I picked up some more herbs on Sunday. One of them was this Gorizia rosemary. It is an upright variety with large, flat leaves. I’m looking forward to see this grow. I think I may have mentioned that I haven’t had a of luck with basil, though I think the problem has been putting plants outside too early. Anyway, I bought this red Freddy basil, which is such a lovely purple colour with little specks of green. It looks like the temperatures may drop again a bit this week, so will keep it on the kitchen windowsill for few more days. Still on basil, I put a plant I bought for cooking outside to see what would happen…and it seems to be throwing out new leaves. Let us see! I picked up this because it looks so beautiful, and oregano family plants are always so useful in the kitchen. Apparently the flowers attract bees and butterflies, which can only be a good thing. I really hope this plant flourishes, as apparently it has bright lavender blooms that are edible with a spicy scent and mild sweet flavour. The leaves and blooms contain antiseptic compounds which can be infused as a tea to soothe sore throats and ease cold symptoms. However, it is looking a little sad, perhaps due to being a bit dry (that has been remedied!). The lemon thyme is flourishing, and I grabbed a few leaves before the rain started to add to tonight’s dinner. The curry plant though is looking a bit sad, with quite a few brown spots on the leaves. I’ve moved its position and will keep my eye on it. So that’s it for this week. I look forward to seeing all the other Six on Saturday posts. Nice ruffled rose. I’ve still got two roses flowering as we get our first frosts. Oh nice! Roses are so resilient. Lovely roses and I can almost smell some of those herbs, particularly the rosemary. Oh yes the rosemary is fantastic. Keeping it under the kitchen window as it is supposed to keep insects away. The ago of those roses is amazing. Wow. Didn’t realise they lived that long. I’m a bit intrigues by a rose collection in a cemetery, so shall go look that up. Some very lovely herbs you have there, as well. https://boltoncemetery.org.nz/history/ gives a bit about the history of the graveyard itself. There are some wonderful flowers there, lots of narcissi in spring. Building up my herb collection bit by bit. I did a bit of a search after I commented, but didn’t come across that link, which was rather interesting, especially seeing how the attitude toward the cemetery itself changed over time. I’ve since found articles on the heritage roses, as well. What an interesting place. They are well looked aftervI think, but still things do happen! Glad you still have some blooms. Yes those roses are lovely. Lovely to see your roses. I love the soft pink of the first one. I have Félicité Perpétué and it is a beauty. You have a great herb collection. Thank you! Building up the herbs bit by bit. Hooray for a Southern Hemisphere garden to drool over whilst we all shiver over here! Lovely to see roses. I have Felicite Perpetue in my garden and it’s so pretty. Happy gardening. Thank you! Nice to hear you have that rose in your garden. I think I have the felicitie perpetuitie. Strictly speaking, next door have it but it sprawls along our fence. it’s a little bit out of control. It’s lovely when it flowers but it doesn’t flower for long. It’ll be interesting to see how long it lasts when walking to work. It is a lovely rose. Such beautiful roses – my favourite is dublin bay a deep red colour. I have a vege garden though, I don’t like sprays and pesticides so I practice companion planting which is putting appropriate herbs and flower next to the veges – it’s worked a treat so far. I love the idea of putting herbs and flowers in between vegetables. I noticed that the planting suggestion for the rosemary I just got was to put it with roses. As an ex Wellingtonian I found your post and also the post about the cemetery very interesting. Hard to believe that pink rose is so old and still flowering beautifully. It must have been flowering like that when I was a child! At least, it said that on the label, so I am presuming it is correct! When did you move away from Wellington? Many many years ago! I lived there until I was 12, and then later I taught at St Mark’s School opposite the Basin Reserve. I have very fond memories of Wellington. Oh my step-son went to Wellington College so I know exactly where St Mark’s is! I don’t what it is about basil. Some people grow it so easily. Anyway hope handsome Freddy survives! Bergamot is one of my love/hate plants. I love the flowers but dislike the scent of the leaves (it’s used in Earl Grey Tea and I can’t get on with it for some reason). I also struggle to get them to overwinter here. I look forward to seeing how yours gets on as the lavender coloured flower sounds lovely. I’ve only ever grown the red ones that look like jester’s hats! I’n hoping It will attract bees…but we’ll see. I think I might have to move it for part of the winter, though where we live we very rarely get a frost.